Lumenium LLC is a Virginia-based startup developing an innovative family of internal combustion engines. Their Inverse Displacement Asymmetrical Rotational (IDAR) engine is a novel and totally singular design for producing powerful, efficient, internal combustion. Its unique engine geometry permits dramatic yet efficient work output from a small, light engine consuming less fuel and producing lower emissions. Rapid prototyping is particularly essential for startups. For Lumenium, the ability to quickly iterate on part features and designs is critical for time to market and engine performance. While Lumenium currently uses an in-house CNC machine and wire electrical discharge machining (EDM) to make prototype parts, the process is relatively time consuming and costly. They are seeking a faster, more cost-effective approach to prototyping parts within the engine assembly. Lumenium’s parts must withstand the extreme heat and stress inherent to internal combustion engine operation. Each engine component must adhere to specific requirements—including high dimensional accuracy, strength under dynamic loads, and low thermal expansion—and the weight of each part is an important consideration for overall power density and efficiency. Additive manufacturing allows Lumenium to meet these requirements and tackle complex part geometries—like internal cooling channels to improve engine performance. With the Studio System, Lumenium can bring this technology into their existing workspace for faster design iteration and functional prototyping. Internal combustion engines represent a $350 billion market with three categories of engines: the traditional piston engine, novel opposed piston engines, and rotary engines. Lumenium’s IDAR engine technology adds a fourth category sitting in the middle of traditional engine technology, representing a paradigm shift in the power production. The engines operate under substantial heat and stress so engine components must withstand dynamic loading conditions, combustion forces of 1500 psi, and combustion temperatures of 1500 °C. Designing a complex product with extremely high performance requirements has led to multiple generations of engine designs, each with a long conceptual phase of designing, prototyping, and iterating. The ability to perform frequent design iteration has a significantly beneficial impact on final engine performance. The full engine development cycle for each generation of the IDAR engine takes between three to five years. 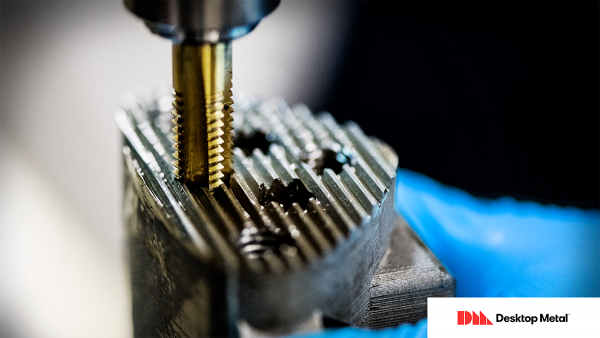 Identifying a faster, more cost–effective approach to prototyping is critical to IDAR engine development, and the ability to lightweight parts while adhering to other mechanical property requirements directly impacts engine performance. Lumenium makes approximately 20 prototype parts per month. The majority (about 95%) are manufactured in-house using 5-axis CNC machining and wire EDM. Machining complex geometries with CNC involves many complicated tool paths and sometimes more than 80 different machining operations. Each operation requires re-programming, which often involves custom fixturing and an operator to realign the part. Even if post machining is required on the printed part, the number of overall machining operations is significantly less. Programming the CNC machine requires a trained, dedicated operator and can take weeks for a single, more complex job—from design to creating the CNC tool path to fixturing to machining. Some parts require post processing by outside vendors adding up to three weeks to the fabrication. The remaining 5% of prototype parts—typically conventional, round parts—are sent to an outside machine shop where lead times average about three weeks. The long lead time limits Lumenium’s ability to iterate on the design, thus having a direct impact on engine performance. In addition to extended lead time and high costs, machining offers only limited options for light-weighting parts. Weight is critical to engine performance where a 50% reduction in engine weight can potentially double the rated engine speed (RPM) and power output. To reduce weight with machining methods, engineers can do little beyond selecting a lightweight material. Without changing material, reducing weight via machining typically requires altering the part geometry—adding time and complexity—which can result in weak points within the part structure. Early versions of the engine used parts machined from solid blocks of aluminum, a lightweight alloy. However, aluminum expands as temperatures increase which is an unfavorable property for engine components that operate at high temperatures. Steel has a coefficient of thermal expansion that is 68% less than aluminum. The Studio System prints parts with closed-cell infill—an internal lattice structure printed throughout the part. Users can adjust infill spacing to meet strength and weight requirements. Parts printed with infill will have significantly lower thermal transfer. This reduces part weight while maintaining strength, which enables Lumenium to pursue steel as part of their solution. Lumenium submitted three parts for initial benchmarking. These parts fit together in a sub-assembly of the IDAR engine, and some design modifications were made to adapt them for 3D printing on the Studio System. For each of the three parts, the Studio System proved to be faster and less expensive than the machined alternative. To illustrate the fabrication process and benefits, we will examine the saddle carrier. In most extrusion based 3D printing methods, including Bound Metal Deposition, horizontal holes require internal support structures to retain the shape. However, adapting the shape of the hole can eliminate the need for supports. Lumenium modified the design, changing the round holes to a more angular shape (i.e. a teardrop) which do not require support structures during fabrication. The Lumenium saddle design consists of serrations along the top and bottom edges that mate with the swing arms. The serrations help the component withstand engine forces, and machining these critical features allows for a smooth and accurate mating surface than cannot be achieved by printing alone. 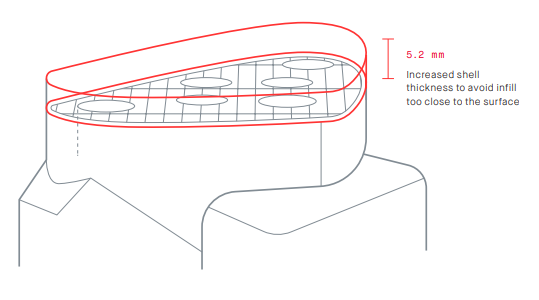 In Fabricate, users can adjust shell thickness selectively. It is important to note that this does not change the dimensions of the part. Instead, it thickens the solid shell around the part to prevent exposing the part’s infill during machining. Lumenium increased the shell thickness of only the top- and bottom-facing features to 5.2 mm to account for material that would be removed during machining of the serrations. Once fabricated, Lumenium performed critical post-processing steps on the printed parts. This includes CNC machining and wire EDM. When compared to a strictly machined part, the number of post-processing steps is fewer and relatively easier to perform due to less fixturing and programming required. Lumenium machined the saddle’s critical surfaces, added serrations to the top and bottom, and drilled and threaded holes. Once complete, they bolted together the saddle and swing arm. For Lumenium, rapid prototyping is critical to product development and maturation as the IDAR engine approaches commercialization. The design and function of each part within the assembly is critical, so the ability to refine and iterate quickly has a direct impact on the overall engine performance. Previous methods of machining each prototype part—either in-house or by an outside machine shop—are time–consuming and costly. 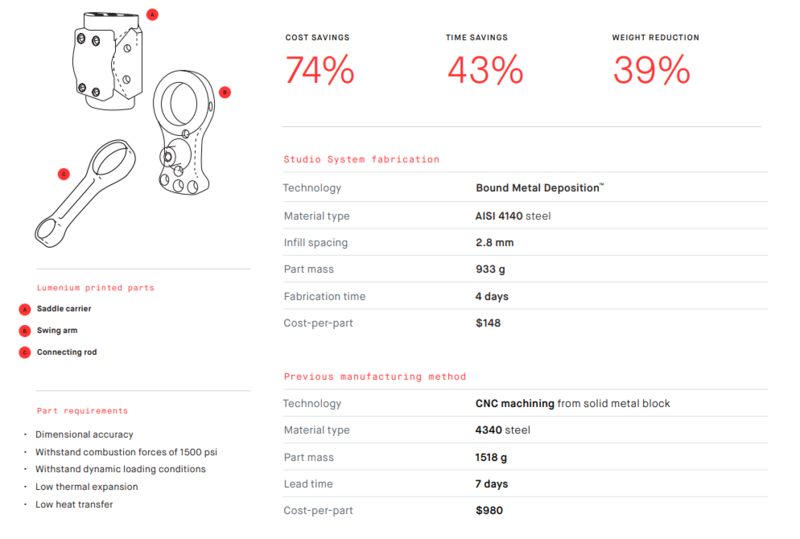 The printed saddle, swing arm, and connecting rod demonstrate the time and cost savings that the system delivers. Given the time associated with programming CNC machines, labor costs, and design limitations, the Studio System would cut Lumenium’s design iteration time in half. With a full development cycle of 3 to 5 years, the time savings has significant impact on the product development cycle and the revenue model. Part 2 of this case study will focus on functional testing of the printed engine components, exploring trade-offs between light-weighting and strength for different infill settings. In-house metal 3D printing could cut the concept phase by a quarter, design by one third, and fabrication/iteration by one-half, leading to a 25% reduction in Lumenium’s product development cycle.